The Skyline (or, in some specific very early versions, Skyliner) was an effort by Eversharp to modernize its look. The deco styling of its previous pens was becoming stale, so the Skyline was designed to be part of the new “Streamline” look (overlooking for a fact that Streamline was already about a decade old). The fellow tasked with this redesign was Henry Dreyfuss, who was a big name industrial designer at the time, and would remain so for years to come; there’s a very good chance the telephone you grew up with was his idea. With the cap on, this is a pen that gives a sense of being able to move through the air with little opposition, and it’s darn pretty. This new styling is, from an ergonomic standpoint, neither here nor there, but if it can look cool without interfering with the function, that’s a sort of a victory. The Skyline was produced in a bewildering array of striped plastics and degrees of gold-plating as well as three sizes. 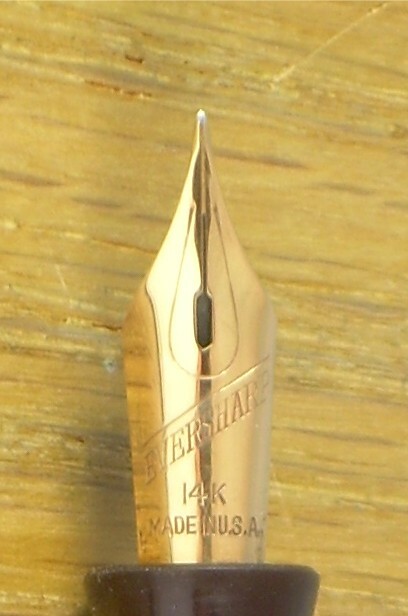 During its production run, the Skyline was the post popular pen in America. It was not necessarily the most desirable, mind you, a laurel which almost certainly goes to the Parker “51”, but unlike the Parker, Eversharp had chosen body materials that were not considered vital to the war effort and could be made in (relatively) unlimited quantities. So, while one waited and waited for a Parker “51”, the urge for something more avant-garde than a Sheaffer could be filled with the Skyline! These pens are not, of course, without problems. The most pressing, for the modern user, is that most of the plastics are early plastics, given to shrinkage and generally brittle; dropping or incautious efforts at repair can easily end in tears. 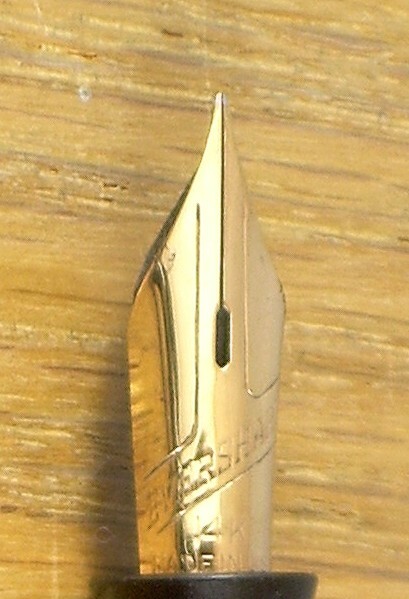 Less fatal is that the design of the pen puts the cap athwart the lever when posted, resulting in a rather stereotype removal of plating from the lever. This could be a worse problem, though, as half the production run lies in the wartime restrictions, and what the removal of the plating tends to reveal is silver. I’m of two minds about these pens, as a useful pen. In most, there is a breather tube which allows a very complete filling of the sac, but that’s accomplished with a rather sharp lever that is not particularly comfortable to flap up and down three or four times in a row. The foot of the clip is of such a construction that the slightest damage to is turns it into something that seems designed to chop the edge of a pocket to literal ribbons. These matters are counterbalanced by some remarkably nice points, which are a delight to write with whether flexible or firm. There are two later manifestations of the Skyline, both with modern cartridge/converter innards. The first was a short-lived reproduction made under licence by a company in Le Mans, France, called SERMEC. Their production ended when the company was sold to Waterman which was almost immediately thereafter bought by Newell-Rubbermaid. The later company apparently claimed to have destroyed all the tools and molds connected with the Skyline’s production. The second revival sees the pen being produced in Italy, by a company run in part by someone whose family previously owned SERMEC and in part by a noted Wahl-Eversharp historian. The machinery previously listed as destroyed was recovered, so the newest Skylines promise to be much like the newer ones, which are generally praised (although, having never laid hands on one, I can’t really comment intelligently). Production Run: 1941 – 1948 (also 1995 – 1999 and 2013 onwards, but none of what follows applies unless particularly noted). Cost When New: Depending on size and trim, between $3.50 for a solid colour demi and $75.00 for full solid platinum body; one suspects the platinum version was not a big seller (for modern values, try this calculator). Initial prices on the 2013 release are $150 for the “Skyliner 50” basic model, up to $365 for the “Skyline Award” all-metal model. Demi: 12.3 cm long capped, 13.6 cm posted, 11.9 cm uncapped; the last two are a little approximate, given the variation in points, seen below. Standard: 13.0 cm long capped, 14.4 cm posted, 12.3 cm uncapped; same caveat. Body: Polystrene, although some were of celluloid. Filler: Lever (but with some aspects of a bulb-filler), capacity approx. 1.2 ml. Eversharp Skyline, standard size, basic model, in Jet Black. 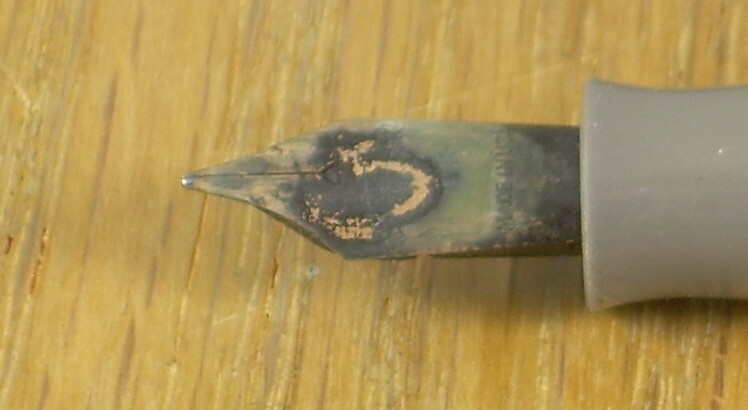 With the cap posted, you can see the problem with plating-removal on the lever, and you can also see that this is a pen that was meant to be appreciated with its cap on. There! That’s a shape you pay a famous industrial designer for. Skyline “Presentation” model, demi size, Dubonnet Red. Another “Presentation” demi, in burgundy. I have not been able to turn up a reason for some having gold derbies and some not. Year of production? Christmas variant? Dunno. This is an even baser than base model, in Silver Grey, which lacks the decorative top-strap treatment of the clip; some of this form lack the warranty “double-check” impression on the clip. A repair manual calls this sub-model a “Streamliner”. This is apparently not an old-style point, but a low-end point. See below to find why it looks a little rough. 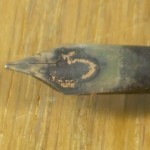 The later “T” point. This is more of a semi-flex point, while the first of this series is rather firm. 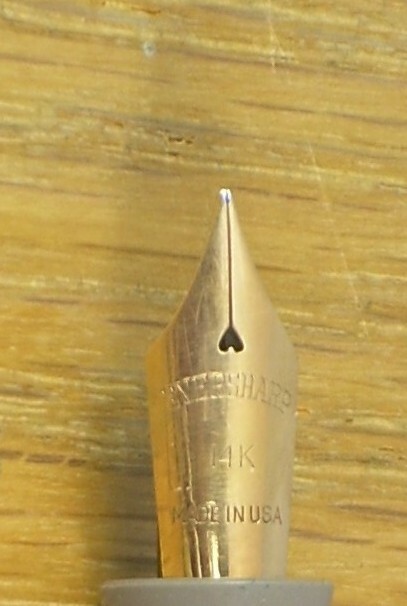 This point is an earlier “teardrop” style, and is also quite flexible – notice how far the shoulders are from the tip.